Who doesn’t love a juicy bacon cheeseburger every once in a while? I know I do, and when I love something with the passion I feel for bacon cheeseburgers, I get a strange longing to morph it into different shapes. I did this with lasagna, I did this with macaroni and cheese, and I did it with tacos. So it was really only a matter of time before I took a perfectly innocent bacon cheeseburger and turned it into a bowl of pasta. And while I was at it (and please don’t feel like you need to follow my crazy lead here), I decided that I might as well try grinding my own meat for once. I’d heard tell that buying your own chuck steak and grinding is a million times better than using the packaged ground beef. So I threw caution to the wind and ground my own beef. And even though this took all of about 5 extra minutes, I felt extremely superior about the whole thing…and yes, it tasted amazing. What really struck me was the consistency…grinding beef at home gives you a textured, slightly chewy, totally delicious taste sensation that is nothing like your garden variety burgers. And while while you certainly CAN go out and buy an official meat grinder, you can also grind beef perfectly wonderfully in that handy food processor that is probably sitting on your kitchen counter right this minute. If you are interested in going on your own meant-grinding adventure, here’s a handy link to an article in Bon Appetit that will tell you everything you need to know. However, this recipe will work just fine with regular supermarket ground beef as well, so don’t let my meat-grinding obsession scare you off. 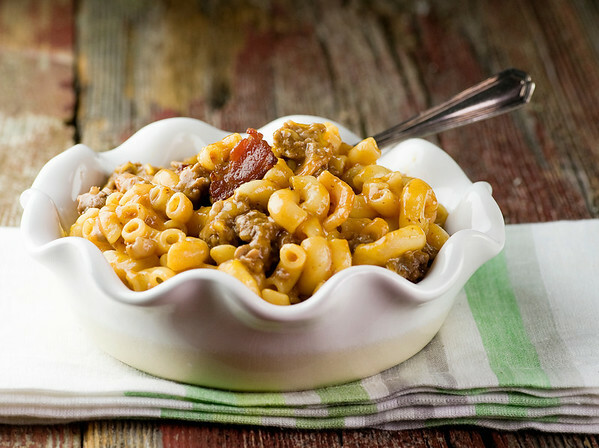 In addition to your ground beef, you’re going to need some bacon (natch), some elbow macaroni, some shredded cheddar and a can of good old tomato soup. The pasta gets cooked the regular old way, and the beef and bacon cook up in a skillet until they are nice and done. At the end you will mix everything up together – the tomato soup will make a fun, slightly ketchupy sauce, and the cheese is the finishing touch. So the next time you get that familiar bacon cheeseburger craving, give this version a whirl. I’m not saying you’ll never go back, but you might be tempted! Cook beef in a large skillet over medium high until done. Remove and set aside, drain skillet. Cook bacon in the same skillet until crispy. Remove with slotted spoon and drain on paper towels. Return beef to skillet, add cooked pasta and soup and heat through over medium heat. Stir in bacon. Sprinkle cheese on top, cover and cook until cheese is melted, about 3-5 minutes. Serve at once. Man oh man… this is another home run I can tell! I think you might have just turned mac and cheese into a controlled substance lol! In a good way! LOL! You might be right! Such a tasty idea! Swapped the soup for cream of mushroom (tomato allergy in the house) went with swiss instead and omg so good. I wonder how an avocado would hold up in this. Makes a good leftover lunch too! Well, I always think avocados make everything better – they work on burgers so I think they would be scrumptious in this!! Made the Pork Chops with Milk Gravy last night – served with mashed potatoes and green beans – Oh, Lawd….were they ever good!! My husband corrected me and said, “no, they were great! !” Thanks for the recipe; it has been added to my monthly rotation. This time, you’ve been peeking at my kitchen. Or my college roommate’s. ;) This has been a favorite since Uni. We used the old blue box and cooked the meats with taco seasoning for a little zip, but essentially the same. I often grind my own burger meat, too, mix my coarser grid half and half with the store variety for a better texture. If your meat prices are comparable to ours here in CA, then it’s also much cheaper to grind your own. I love finding a fellow meat-grinding fan! Genius on the taco seasoning, BTW! out of this world. Easy to make. Thank you . Mark Jr.